Typically, my kid’s ideal of “playtime with dad” involves activities such as him tacking me to the ground while each of us attempts to tickle the other into submission, or me tossing him in the air as I pretend to “make pizza” while singing in a terrible Italian accent. While moments such at these are a whole lot of fun, it is also important to balance them out with quiet, calming projects that invoke his creative side. 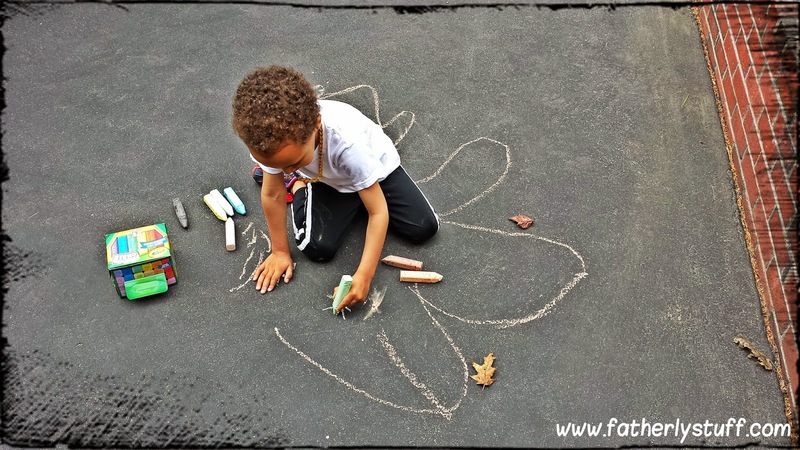 Children are massive supernovas of energy who also possess the attention span of a flea, so the ability to get and maintain composure is something that needs to be taught; Encouraging the transition to low-key, imaginative play from time to time will help them develop the skills needed to do just that. A great way to accomplish this is to combine creativity with the proper nourishment, and Juicy Juice 100% juice manages to do just that. 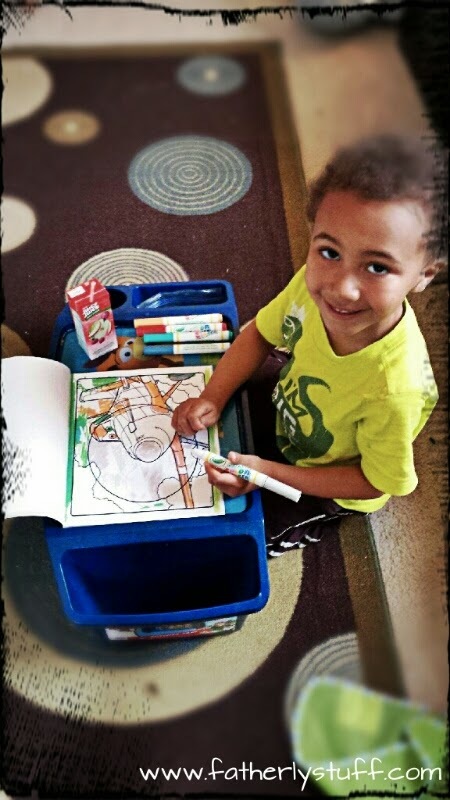 ...and then on the carpet, with his Crayola Color Wonder Mess Free Coloring Book! 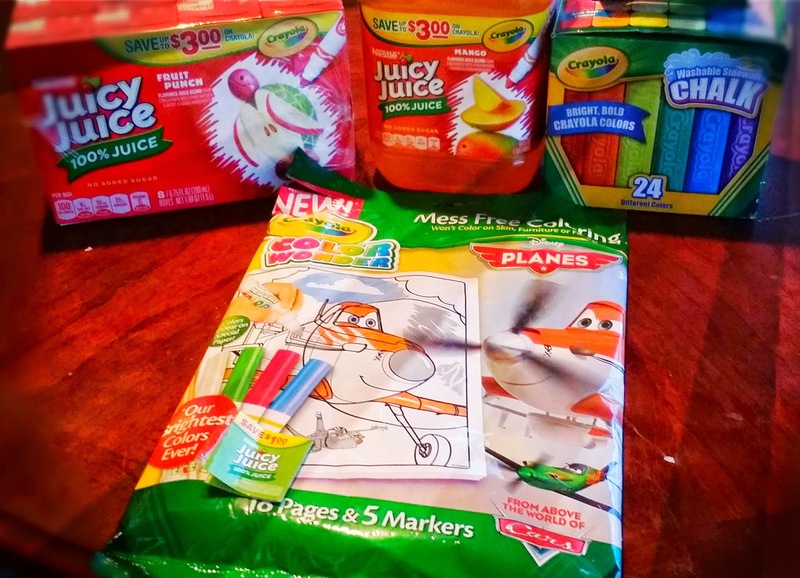 Juicy Juice 100% juice can be found at your local Walmart in the juice aisle. 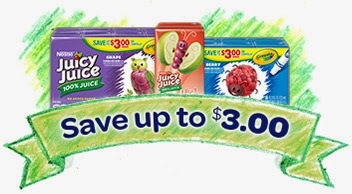 While you're there, make sure that you take advantage of the $3 off coupon that is on the Juicy Juice packaging to purchase any one of the wide array of Crayola products. This offer will be running through September. When it comes to playing with your kids, remember that it doesn't always have to be rough and tumble. 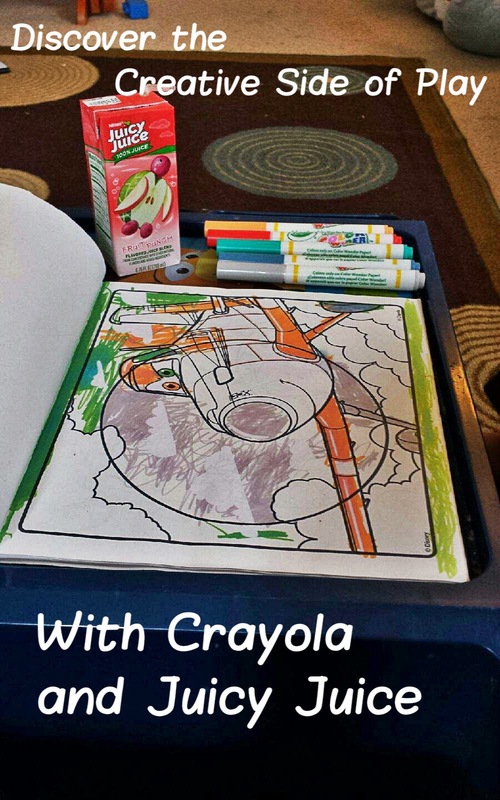 Sometimes, all you need are the right tools, like Crayola, paired with the your child's favorite Juicy Juice. Like most parents who have more than one child, I regularly find myself faced with the difficult task of dividing my attention evenly between my kids. In addition to spending time together as a family, I also make a conscious effort to spend time with both my boys individually in order to prevent either of them from feeling slighted in any shape or form. According to a recently scientific study however, I may already be too late. The results of this research claim that children who are firstborn tend to become more successful than their younger siblings. Now, as a middle child out of a total 5 siblings, I was a little reluctant to accept this. And while the order of a child's birth doesn’t necessarily guarantee their outcome in life, the facts are hard to ignore. For instance, of the 12 men who walked the moon, 10 were first born children and the other two were the only child in their family. There are also an extraordinary number of celebrities, CEO’s and Nobel Prize winners who are firstborn as well. So what is the reason for this? There are a few theories that try to explain this intriguing phenomenon. First of all, from the time the first child is born until the arrival of the second, there are no other competitors for parents’ attention. Another factor is the additional responsibility that is placed on the oldest to look after and/or set the example for their younger siblings. Indeed, my oldest is not even 5 years old, yet I tend to remind him of his status as role model to his little brother in order to discourage his negative behavior. Thirdly, when it comes to discipline, parents tend to be a little firmer on the oldest as something of a “signaling mechanism” to the other children. This seems to be the most efficient and least expensive method in which to dole out discipline amongst multiple children. Apparently, these combined experiences will mold my oldest son’s psyche and provide him with the tools that will make him more likely to become successful. So what real-life conclusions can we draw from these studies? Should I just place all my hopes of being cared for in my old age in my oldest? Well as I mentioned before, there are simply too many other indicators that factor into how a child turns out besides the order of birth. But as scientists try to learn more and more about human nature, hopefully I can learn something about myself in the process and in turn, become a better father. Question: Do you agree that oldest siblings are more successful? When our 2nd child was born last summer, my wife and I made the decision that she would quit her job in order to be a stay at home mom to our boys. The cost of daycare for the both of them would have been almost double our rent and her salary at the time did not justify the expense. So for us, it was a choice that made complete sense. Although the transition has been great for the most part, there were certainly obstacles. The growth of our family meant an increase in our expenses, yet now we have less money coming in than before. Now that I am the sole earner in the household, it’s been more important than ever for us to find ways to keep within our newly restructured budget. One of our main focuses is our energy bill. In order to conserve and keep our utility bill as low as possible, we all try to do our part by turning off lights behind us, opening the curtains to let the sun in for natural light, or even making sure the fridge isn't left open for longer than it needs to be. 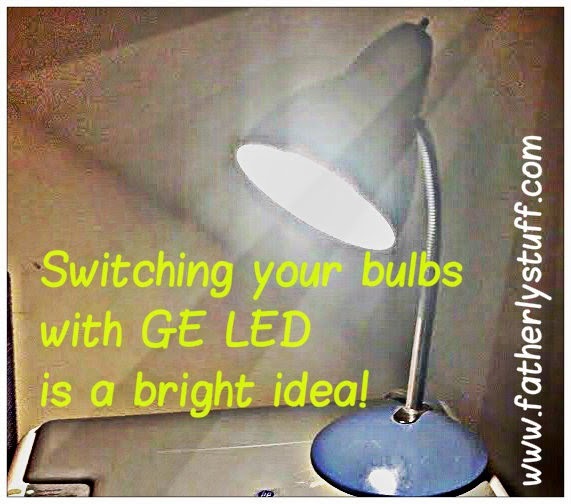 Another way that we’ve been able to accomplish this is by replacing our incandescent bulbs with GE Energy Smart Bulbs. 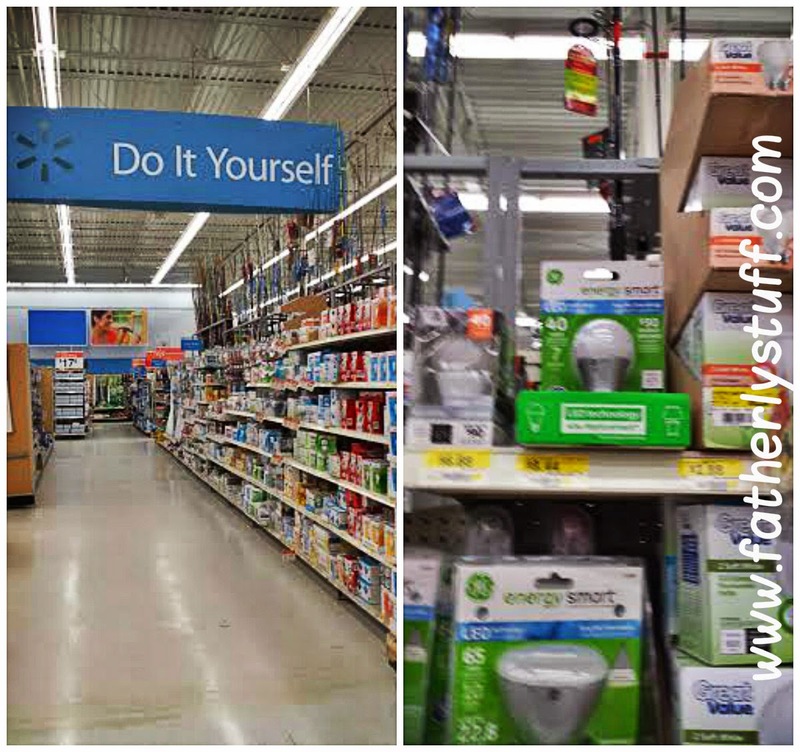 GE Energy LED Bulbs can be easily found at your local Walmart. 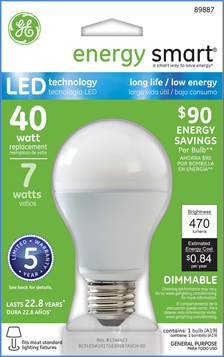 Anyone who is interested in saving money should really give this bulb a serious look. 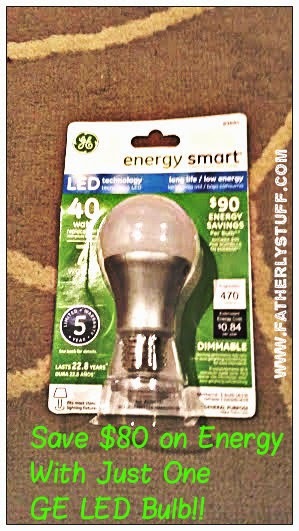 Because they're energy efficient, they're not only good for your wallet, but they're also great for the environment. 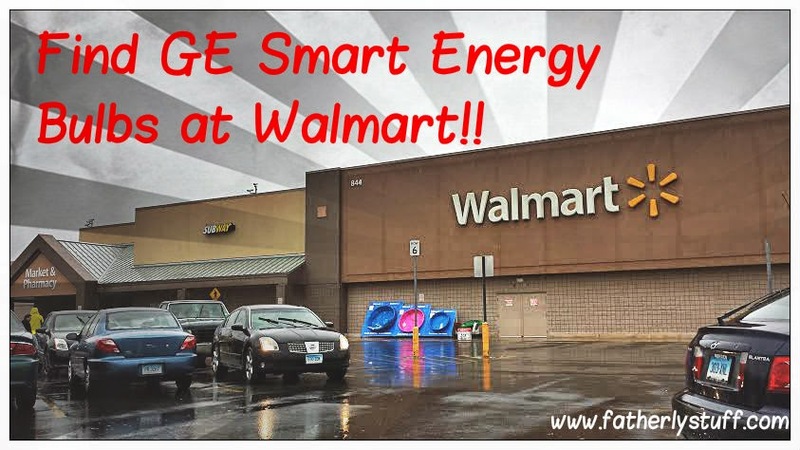 So head down to your nearest Walmart and take the first step in gaining control of your budget. It was a simple switch, but it has made a world of difference for me and my family. Now, my wife can be home with our children and the budget is one less thing she has to worry about. A big thank you to #CollectiveBias for giving me the opportunity to share my story!